Like so many of the best composers for brass band – Eric Ball, Wilfred Heaton, Elgar Howarth and Robert Simpson – Edward Gregson’s youthful talents came to the fore in the Salvation Army. 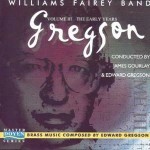 In 1975 Gregson was commissioned by the Chalk Farm Band of the Salvation Army to write a march for the centenary of the birth of the band’s most long-serving bandmaster Alfred W Punchard, who conducted the band from 1894 to 1944. In 1909 the Salvation Army published a march called Chalk Farm featuring the old Army chorus ‘March on, we shall win the day’. Gregson uses the same tune in his Chalk Farm No 2 march, but this is a symphonic march clearly to be played sitting down. He includes irregular bars of 5 and 7 beats as well as a tongue-in-cheek treatment of the tune, complete with bongos (in the march) and bi-tonality (in the trio). Chalk Farm No 2 imaginatively composed. 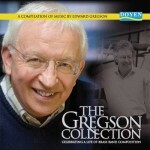 Gregson’s own main theme ‘fits’ the chorus as a counter-subject. The playful irreverence of the style has more in common with Wilfred Heaton’s Praise or Glory, than the conventional Salvation Army March.